The Broad Street Station, just off Broad Street at Lackawanna Place, University Avenue, and Martin Luther King Boulevard, is one of Newark's most recognizable landmarks. Nineteenth and 20th century manufacturers wanted to get raw materials into the city quickly and transport their finished products out as quickly, cheaply, and easily as possible. In doing so, Newark made the right choice by choosing the railroad over the stage, canal and, at an earlier time, coastal schooners. The invention of the rail engine by John Stevens of Hoboken found Newarkers turning to rail use as early as 1832, when the New Jersey Rail Road Transportation Co. was organized. Still, there were obstacles, namely overcoming the mud and muck of the Meadows and removing the great rock formation between Newark and Jersey City. The company also had to purchase a bridge monopoly over the Passaic. By 1835, the first locomotive, 'The Newark,' ran over the tracks to the foot of Bergen Hill. The first train left Newark for New Brunswick. Thus far, Newark was connected by rail to the south and east. By then it seemed reasonable that attention should be pointed west toward Morristown. Soon, the idea of the Morris and Essex Railroad Company emerged with influential residents of Morristown taking the lead. A charter from the Legislature provided for $300,000 of capital stock with the authority to increase it to $500,000. Books for subscription of the stock were opened in Morristown, Elizabeth and Newark. Stockholders then organized the company at Chatham. After considerable discussion, the owners decided to run the rails through Orange, rather than Irvington, because the necessary land was cheaper for the right of way. The project became successful with the help of Seth Boyden, who turned his inventive creativity to developing a locomotive capable of overcoming the steep grades west of Newark. Not only did Boyden invent a successful locomotive, he was seated at the throttle as it puffed over the Orange hills in July 1837. The six-ton 'Orange' was later joined by 'The Essex,' making the new railway an immediate hit. An 1835 broadside declared: 'This road was chartered January 29th, 1835, and the Company commenced running their cars by horse power, from Newark to Orange November 19, 1836; from Newark to Madison, by steam power, on Monday the second of October, 1837; and from Newark to Morristown, on the first day of January 1838; March 1st, 1842, an act was passed by the Legislature for the relief of this road, and on Monday 18th of April, 1842, the road was sold and the purchases began to lay iron rails down the middle of September, and finished the middle of January, 1843, being only eighteen weeks and the year past, this road has been continued to Dover, and will be ready for use early this spring.' The influential officers of the new company included William Wright, president; Beach Vanderpool, treasurer; J. C. Garthwaite, secretary, and Ira Dodd, superintendent. At this point Newark was becoming a center for railroads, insuring the city another century and a half of leadership as well as laying the foundation for making Newark one of the nation's best transportation systems. 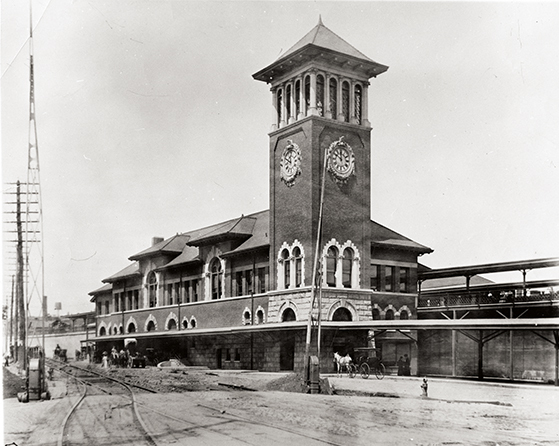 The first Delaware, Lackawanna and Western Railroad station was a two-story brick building east of Broad Street with a square bell tower or campanile rising from the central part of the structure. Seven long windows along its north wall overlooked the double street level tracks where double railroad engines pulled passenger trains. Broad Street was paved in brick or Belgium blocks, and the train tracks until 1903 crossed at grade level. The old station was razed in 1901-1903 to make way for the present structure to the west of Broad Street. It runs along the modern Route 280, a few hundred feet from the Pavilion Apartments, and the nearby Plume House of the House of Prayer at Broad and State streets. In the early days a great amount of freight was carried over the old Morris Canal. But after the Morris and Essex Railroad added the two locomotives, 'The Orange' and 'The Essex,' it was believed that they would stop anywhere for travelers or to drive cows from the tracks. At first, Newark was the end of the line when heading for New York. At this point, engines were exchanged at Division Street for horses which pulled the cars down Broad Street to Center Street, where they were attached to the eastbound trains of the New Jersey Railroad. A railroad spur was established by the New Jersey Railroad, extending from Center Street to the Commons, now Military Park, and down Broad Street as far as Thomas Street. This meant shop owners could have freight brought to their front doors. To the west, the Morris and Essex line extended to Morristown by 1839, Dover by 1848, and Hackettstown by 1864. At first, only freight was carried on the line, but by 1853 passenger service was added. By 1869, the Morris and Essex was approached by Delaware Lackawanna and Western president Samuel Sloan to become a part of the expanding DL and W system. The following year a new line opened for the shipping of coal, while the Morris and Essex concentrated on passenger service from the constantly expanding suburbs. In 1899, Samuel Sloan retired as president of the DL and W. He was succeeded by William H. Truesdale, whose primary concern was the efficient shipment of coal from the DL and W owned mines. In his 1899 annual report, Truesdale noted, 'The large and increasingly suburban traffic of the company on its Morris and Essex Division will require heavy expenditures during the next years in the way of track elevations, additional main tracks, stations and facilities for the safe and efficient handling thereof. Economies can thus be affected which will aggregate almost enough to pay the interest on the cost of the work.' The stage had been set for the replacement of the original Morris and Essex railroad station, east of Broad Street on the site of today's Lincoln Motel, for a new terminal in a new century. Today, we call it the Broad Street Station. The second or present Broad Street Station, a Newark landmark, was built between 1901-1903. It is considered an exceptionally fine example of railroad architectural eclecticism, a popular style during the early part of the 20th century. Its architect, Frank J. Niles, considered it Renaissance/Classical Revival. Niles relied heavily on various Renaissance forms of ornamentation which included the distinctive campanile, rusticated base, voussoirs, lintels, quoins and pilasters, 'integrating them into a building type defined to modern functional needs.' Niles worked with the staff of the Engineering and Architect Department of the DL and W Railroad Co. The building was designed at a time when all the major railroads were beginning to elevate their tracks in the state's major cities. A series of decorative windows embellish the building's exterior. The exterior walls are of red brick, the base of rusticated limestone that looks as massive as the great pyramids of Egypt. The roofing is asphalt shingle. The building we see standing today is pretty much a product of 20th century needs. It is more elaborate than its predecessor and is built around an elevated system designed for greater downtown safety. It was the most important station on the Morris and Essex line and the Delaware Lackawanna and Western Line and is a major stop on the present New Jersey transit run. Over the years its function has changed from being an important stop for long distance passenger trains from Scranton, Buffalo and points west to a heavily used stop for commuters to Newark. Renovations in the 1980s were made to allow for more storage area and to upgrade passenger spaces. New areas were added to the state's most endangered historical building list by the present owners, New Jersey Transit. Portions of the north building were removed for improvements. As the railroad became more powerful, their effect on Newark and most American cities was both good and bad. James Drummond studied Newark's reaction to the railroad in both areas. While track elevation increased local safety, it also produced the great 'Chinese Wall' effect that tended to partition the city into smaller communities. Just look at the Ironbound for example even the name indicates a separate community within the community. But safety was all important. In 1880, Mayor Haynes called for elevating the tracks as a safety measure, especially the Central RR bridges, the Pennsylvania, and the DL and W. In 1894 Mayor Julius A. Lebkuecher made the same demand when he considered the railroad 'dangerous to life.' Mayor James M. Seymour in 1896 echoed the same cry, protesting that 'railroads were a menace to the lives and limbs of our citizens.' He urged legal action through the Board of Street and Water Commissioners, pointing out that an act of 1874 made railroad regulation possible. Railroad officials listened to the demands and recognized their duty to elevate the lines. While this was an enormous task in the economy of 1901, imagine what such a project would cost today. By 1902, all three rail companies operating in Newark were in the process of complying with the law. But tragedy struck on February 19, 1903, as nine Barringer High School students were killed when the trolley they were aboard crashed into a train. Barringer students were packed aboard the North Jersey Street Railway Company trolley headed north along Clifton Avenue from Orange Street. As the trolley started down the slope on Clifton Avenue toward the DL and W track, the motorman applied the brakes, but the vehicle began slipping toward a speeding Bernardsville train. The huge locomotive shattered the trolley, strewing bodies all along the tracks. Their deaths forced city and railroad officials to face the cost of negligence. The terrible tragedy brought safety changes but they could not help the young victims. The 1903 trolley accident was memorialized in a stained glass window originally placed at the old Newark High School, later Barringer. It is a tribute to the eight girls and one boy who lost their lives in the accident and 30 other students who were injured. William R. Cain, Barringer's principal in 1964, said the memorial would be relocated to the new school's auditorium. Mr. and Mrs. E. Ezra Eberhardt of Short Hills who were students at the school at the time of the accident, requested that the Board of Education install the memorial in the new building. Mrs. Eberhardt, the former Gertrude Landmesser, was a 13-year-old freshman when she boarded the trolley near her Van Ness Place home. As the trip began that fateful day, it seemed like just another routine journey until the coach began to slide down Clifton Avenue on the snow and ice-covered tracks. ''I must have been knocked out,' said Mrs. Eberhardt who was sitting in the back of the trolley. 'I woke up laying in the snow. Fortunately, I wasn't badly injured, although I had some bruises.' In later years the Eberhardts owned the machine tool manufacturing firm of Gould and Eberhardt. If New Jersey Transit gets its way in order to meet expanding rail service demands and to comply with the Americans with Disabilities Act, the 93-year-old westbound passenger shelter of the Newark Broad Street station will be demolished. The Star-Ledger has described it as a 'doomed building' and Preservation New Jersey has put it on a list of endangered sites. However, Deborah Kelly, the preservation agency's acting director, feels that this dubious honor helps preservation efforts by acknowledging the site's importance, and drawing attention to its plight. 'We hope the listing results in positive action toward their preservation.' Opinion as to the importance the westbound passenger shelter of the Broad Street Station remains divided. Some feel that compromise can be reached without demolition. Others are opposed to any change in its present condition.